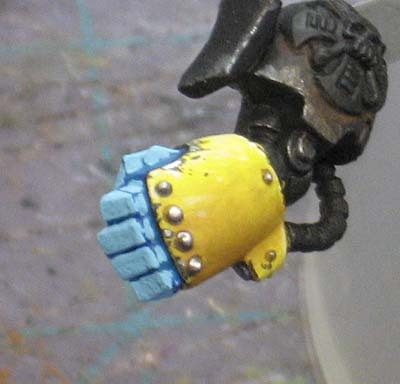 A little while ago, I jumped on someone for their approach to painting a glowing powerfist. Maybe more like offered some unsolicited, unwanted advice telling them to do a better job since I knew they could. Here's my attempt at the same thing as an example of how I would have gone about painting it. Let me apologize for the length of this post. I tried to keep it brief, but found it necessary to explain a number of things in order to try and help folks understand the idea behind the process. And here's the post on Black Matt's blog that inspired this one here. 1. It's not a quick process. 2. You need to be comfortable painting fine details and blending. 3. It requires a basic knowledge of object source lighting. That being said, let's get to it. 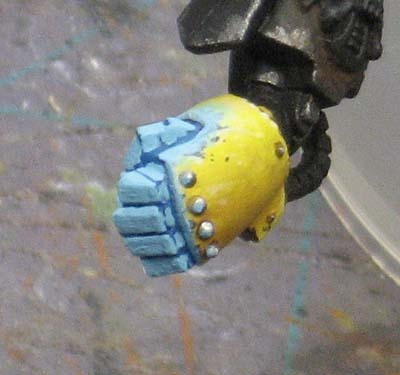 The first thing for me to do was to find a powerfist and paint it up in Imperial Fist colors. I gave it some highlighting, shading and a little battle damage for good measure. I've left the fingers black since they will be the part that is "glowing." I also did not paint any of the arm or have the bit attached to a model for reference and additional lighting considerations. I'm going to focus on just this portion of the model right now. Before we start any painting of the glowing portion, we need to take a quick look at what exactly is glowing and how the light is going to play off the surrounding surfaces. In this case, I've decided it's going to be his hand that glows, but not the armour plating around his hand. You have to look at the model from the direction of the item that is "glowing" to see what parts of the model will catch the surrounding light. Actually, we need to look at it from a number of angles to see where all the light will go. Sometimes this is harder to do than other times. Looking at our hand, we can see the thumb sticks up and will light the top side of the armour plate. 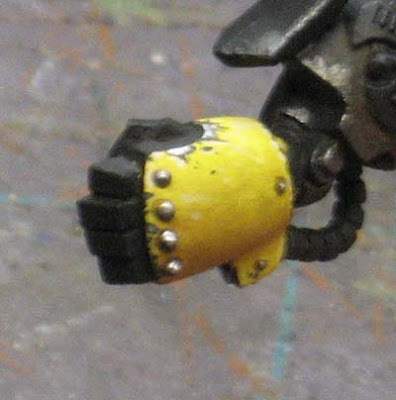 The back of his hand will not be lit as much because the armour comes up and almost overhangs the fingers. Now on the palm side of his hand, the fingers hang over and will light up the inside of the armour plating a little more. After we've figured out where the light is going to go, we have to decide how strong the light is going to be. In this case, I've made it fairly bright. I've taken my brightest points up to white where it is glowing the most to show the light will be "bright." While it's not exact, I'm going for a representation more than duplication. NOTE: It's worth noting that we're going for the "feeling" of the fist being lit from within like it's glowing more than we are looking for a 100 percent completely accurate duplication of the actual effect. The goal is to convince the viewer it's glowing and we're allowed to take a few liberties to do so if need be. Determining how bright the light is will also determine how far out your lighting goes as well. Brighter lights will have a greater radius and dimmer ones or lights from small sources may not reach out as far. In this case it's bright blue. Some colors will not travel as far as others. Your dark colored lights may not light up as much as your lighter colors (yellows and whites). But keep in mind the intensity and surrounding surfaces too. What is the light shining on? 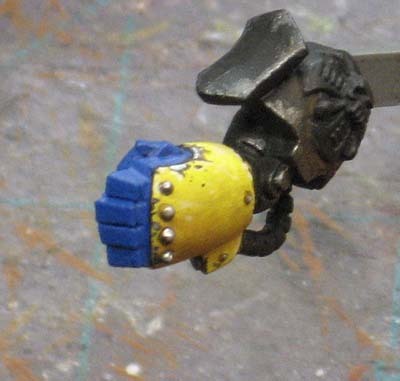 Here the light will be hitting other parts of his armour. This becomes important if some of the surrounding surfaces are glossy as opposed to matte or have a flat finish. We've got a fairly good idea of where the light is going to go. We've decided it's a fairly bright source. We're going with a bright blue color for our light. We know the surrounding surfaces are flat finished armour. To get the glowing effect, we need to paint it like we would paint lava. Since the fist is glowing, it's the core or inside of it that is glowing. Like lava, the closer you get to the core, the brighter the light. The base is from Dark Art Miniatures. So how do we represent that? We do some reverse highlighting. What in the world is that you ask? When we paint lava, we put the brightest color on the inside and get darker as we work outwards or away from the part that is glowing. It's like regular highlighting but reverse the colors. The brighter one goes on the inside and the darker one goes on the outside edges. So let's look at the steps to get this thing painted already. This first layer is the darkest blue. I used Enchanted Blue for the first pass and then Hawk Turquoise after that. I like the two blues for variety. You don't need to use two, but I wanted some variation. If you use one color, then paint the whole glowing area. If you use two colors, then paint the darker one over the whole area and then the second one over just the individual armour plates. After you have your base color down, it's only two other colors after that. 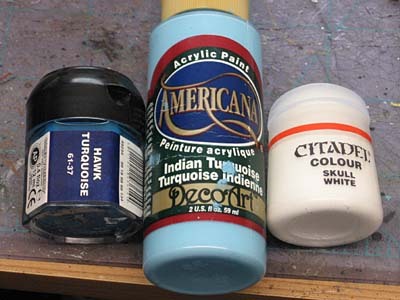 A super light blue (Indian Turquoise by Americana and GW Skull White). You can substitute your colors as you see fit. You can also create a more subtle effect by using darker colors overall. I went to the light end of the spectrum in this example. I have an upcoming Deathwing post where I did the same thing, but kept the light much darker overall. The next step is to take our light blue and paint all the individual armour plates on the fingers. Try and be neat and leave a tiny amount of the darkest blue in all the seams, but you can go back and clean up any mistakes in the end. Now, take your light blue and start adding your "lighting." You can see where we've laid out the basic shape of our glow on the top and outer edge of our armour portion. Be careful not to exceed where the light would actually fall on the surrounding areas or it will kill the illusion. If in doubt, look at the model from whatever angle you need to in order get an idea of where it (the light) would fall. 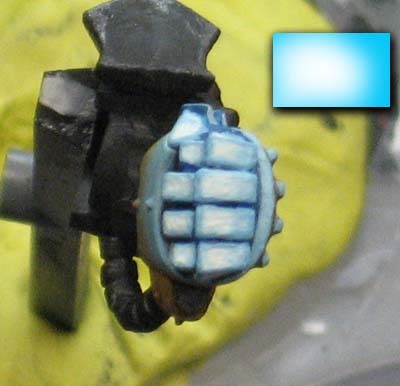 With our glowing armour pieces painted light blue, it's time to add the white glowing "core" to the fingers. Paint those individual armour plates that you just painted light blue with white now. You can leave some of the light blue around the outer edges of the whole glowing area. And now one of the more important parts of this process. This can be the most troubling and time consuming part of this whole thing. You want to highlight the white armour plates with the light blue. Remember the reverse highlighting/lava thing we talked about earlier? Here's where we put it to practice. Not only do we want to line highlight ALL the edges of each finger, we want to try and blend the light blue and the white together (see the inset example). The blending is key. You'll need to get it smooth for this to really pay off. It took me a few minutes to do this part since I kept going back and working over my blends until I had them looking the way I wanted them to. And the final powerfist. 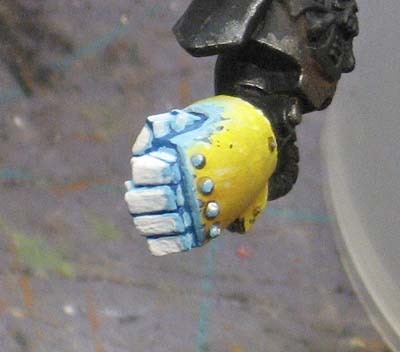 I went back with some really thinned down light blue and added a bunch of layers around the edge of the lighting (on the yellow armour plate) to make it blend into the surrounding surface really smooth. I know it's a ton of stuff and I glanced over a good bit of it, but I hope it helps give you guys an idea of what to do if you want to try this on your own. I don't normally say this, but since it's a huge post and covers so much information... any comments, criticisms and other examples/links are certainly welcome. 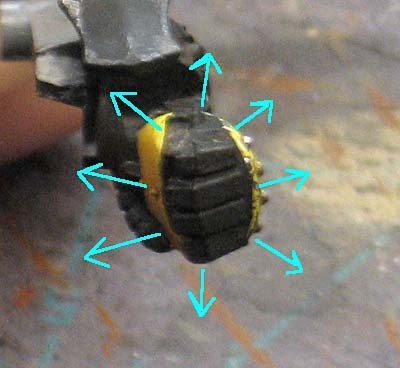 Part 2 covering the mechanics of OSL can be found right here. It may be long, but it is really helpful. You provide very useful insights, and help to make the glowing effects seem easy. Very interesting post. I second Fridge, simply amazing. Great tutorial with lots of details. Keep them coming. Oh man, FTW's got some great tutorials, but these glowing and OSL ones take the cake! I don't feel quite so intimidated with the process which is something I always shied away from. That's truely awesome. Very nice Ron. Great tutorial. I'll have to try it soon. Great tutorial. I am going to have to save this one for a few upcoming projects. Anon: yes, the effect will be "real" once you place the object within an environment and the light is reflected off surrounding elements. In this case, I kept the tutorial focused on just getting the right look to the glowing element itself. You could do another whole piece on the light it casts on nearby objects. Ron this post is just awesome and in Perfect time for me as I have a Malifaux miniature that I am interested in trying the glowing and OSL effects. Your tutorials will be of great help. Thank you! Meatball: Glad it helps. Credit goes to Black Matt for doing what he did though. If he hadn't posted his attempt at it, I would not have been inspired to try my hand at it (no pun intended). Why no greenish edge to the blue glow? I'm assuming because if the pale blue nature of the glow. Would you use a darker set of colors for more of a darker blue and not bring the fade all the to white? Black Matt: Thanks to you for sharing your post. Like I mentioned, I would not have tried this myself had I not seen yours. As for your question, it's answered by a couple reasons. 1. The light is pale blue and fairly strong. 2. Even though it's strong, it can only travel so far and with this kind of lighting, it's an all or nothing. With those gradual blends that cover lots of surface area, the light is parger and further away. Think of a flashlight shining on the ground at night... held up close, the edge of the lighted area is sharp and there is very little transition from light to dark. Pull the flashlight away from the ground and the transition area is much more and you get that gradual fade from light to dark. If I were to go with a darker set of colors, it would be to indicate an object not glowing as bright. I've got yet another Deathwing post I'll be putting up some where I have OSL around his eyes, but used only a dark color for the lightting effect. The eyes are bright, but the glow is next to nothing since the source is so tiny. I hope that helps some and don't confuse people more. I respect that rather than just flaming and moving on you were able to turn constructive criticism into a tutorial that is well within the skill level of the average painter and gets them to look at the subject in a different light (no pun intended). Thanks for including something I wrote. I haven't been painting. I don't really do the source light thing. But I'm pretty good a vibrant highlights and painting glowing looking stuff. Blue and Green seem the easiest to glow though Orange isn't too tough. Hi Ron, I just had a go at this using your tutorial (My first ever attempt), I was just wondering if I could get some pointers/feedback on it if you have time seeing as you have written the two articles now. I tried to make both the face and head of the hammer the source of light (but the brightest is coming from the face) which I then tried to have wash back onto the rest of the hammer in a smaller scale. Red: Do you mind if I take your photo and use it in my next post? You've got some good stuff there, just some mior tweaks and you'll be in business. Sure, of course! Thanks I would appreciate the help. I want to do a full set of these guys. P.s. 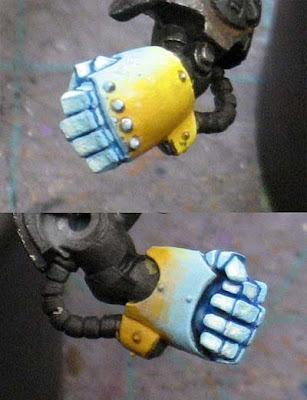 I was having a bit of trouble converting the ideas around the powerfist (I am sure I could confidently paint a powerfist/chainfist/lightning-claw now) and it's rounded shape to the harsh edges of the hammer and how the glow would effect that, I wasn't sure whether to paint the raw Hawk Turquoise into the gully near the haft or leave it metallic. Red: Let me see what I can do to explain what things you could do to finish off the model. I should be able to get something together and have it posted on Monday. How does that sound? Cool, sounds great Ron. I look forward to it. I didn't want to go as far as throwing light on to the actual body of the model itself as the arms are magnetised and these guys swap between ranged and assault. Ron, thanks for another great tutorial. I used your method, and I have linked you up on my blog.